(CTA): The first round of the Miller Lite Men’s Touch League started with a high octane round of games at the Camana Bay field. The four teams (Stallions, Raptors, Samurais and Wolverines) may sound like made-up street gangs that never made the final edit of “West Side Story” but make no mistake – these guys mean business and can cut through any defence like a switchblade between the ribs. It was a good night for the STALLIONS, captained by Ian Smith, who started their campaign with two wins out of two. In their first game they took on and defeated the RAPTORS 5-4. The tries were spread around the team with one a-piece for Nic Swartz, Ian Smith, Jason Scarff, Kent Pearce, and Shaun Hardcastle. The STALLIONS are a mix of experience and novice and Smith was particularly pleased with his newbies contributions. Whilst one knows what you get from those who have lived and loved in the Touch sporting arena it is the performances those who are treading on virgin territory that are often the most pleasing. Nathan Stubing played well and should have scored with his first touch of the ball only to put it down just shy of the try-line. No score – a tough start but a valuable lesson. In this league there are no soft decisions for inexperience. Kent Pearce, another newbie, never stopped running all night. Like a cross between the Duracell Bunny and a kitten chasing a laser-pointer he hunted the ball down all over the pitch. At one point he collided into teammate Swartz with the equivalent of a “Glaswegian Kiss” and had to leave the field seeing stars. It was a tough night too for Smith who, whilst diving to score his try past the despairing lunge of Riley Mullen, popped his shoulder on landing and the dislocation was there for all to see. Smith however, like a biscuit that has been left in the tin too long, is a tough cookie and played on in spite of the pain. The RAPTORS kept the game alive and will be disappointed not to have got something out of the match. Their scores came through the marauding Caledonian hordes of Iain Currie, Scott MacDonald and Robbie True. Ransacking the STALLIONS try-line like dodgy extras from the movie Braveheart, Robbie “So” True delivered two hefty blows, with Currie and MacDonald one each. The SAMURAIS played out an excellent 3-3 draw with WOLVERINES. The SAMURAIS have a couple of early season injuries, notably to Captain Neal Ainscow, and the fleet-footed Andy Childe but, led by Morgan Shelver they delivered on the day. Charles Moore showed great experience, especially in defence, and with Andrew Barker providing some genuine gas and Tom Berry being strong in the wing position they proved very hard to score against. For WOLVERINES, the relentless Neil Montgomery led from the front with his signature jack-knifing switch play and coupled with Rudolf Weder and Dave Acutt they were always threatening in attack. These three are more in harmony than The Bee Gees and judging by Acutt’s new beard he sees himself as the Barry Gibb of the trio! Special mention must go to Dave White who showed fantastic hands on the wing to score; and to Dan Fitton who was like an un-circumnavigable colossus on the wing. In the second round of matches, RAPTORS proved too strong for WOLVERINES with a standout performance by Nick Ebanks. His two tries have announced his entry into the Touch world and other teams better take note that this guy has some serious moves. Riley Mullen added two excellent scores, whilst Marc Randall and Robbie True added one each. Montgomery and Acutt (2) kept WOLVERINES hopeful but ultimately it was a stretch too far losing 6-3. In the final game STALLIONS edged a tough contest against SAMURAIS 6-5. Jason Scarff was outstanding in defence and also nicked a try. Nathan Stubing scored his first Touch try and Ian Smith, Shaun Hardcastle and Nic Swartz (2) also scored. For SAMURAIS Andrew “Kanye” West put in a real shift scoring three important tries, with Andrew Barker and Morgan Shelver getting the extras. (CNS): With the largest team that the Cayman Islands has ever sent to the Commonwealth Games, the 27 athletes will be hoping to bring back more than a Tam o'Shanter from their Scottish fling. Track star Cydonie Mothersill won Cayman’s first and only gold medal at the 2010 Gamesin Delhi but this time around all eyes will be on Ronald Forbes, David Hamil, Tyrell Cuffy, Troy Long, Carl Morgan, Carlos Morgan and Ashleigh Nalty and Kemar Hyman to bring back the sporting 'bling'. The international competition starts with the opening ceremony in Glasgow Wednesday evening (2pm local time), with the games starting on Thursday morning. The Cayman Islands Olympic Committee said that Hyman should be considered a medal favourite when the sprinter takes to the track as his preparation for his races has been very technical. "His coach is well aware of what Hyman’s true potential can be leading up to a race. His determination now is nothing like before, and if he stays focused, not only will he be one of the top contenders but also he will be the favorite to win," the committee said. Ronald Forbes, Cayman's sprint hurdler, will also be looking to do a better job than his sixth place in the final in India with an eye on the podium, and long jumper Carl Morgan, who was down in 14th place in 2010, will also want to make a better impression on the rankings. As well as the track and field stars, Cayman's athletes will be competing in the pool, the boxing ring, the shooting range the squash court and for the first tie in the gymnastic arena. Myron Blair, Eilidh Bridgeman, Julian Jervis, Daniel Murphy, Cameron Stafford and Marlene West will be competing in squash, while Geoffrey Butler, Lara Butler, David Ebanks, Brett Fraser, Lauren Hew and Alex McCallum are the swimmers. Christopher Jackson, Edison McLean and Andrew Schirn form the shooting team. Boxer Tafari Ebanks and cyclist Michele Smith will be going it alone in their respective sporting disciplines for Cayman. Finally, young Bethany Dikau (17) is the first Cayman gymnast to compete at the games and she will be competing on all four pieces of apparatus in the women's competition. The swimmers will be the first athletes going for Commonwealth glory, with Geoffrey Butler opening things up for the Cayman team in the pool for the men’s 400 meter heats. Alongside the athletes and trainers, Governor Helen Kilpatrick and Sports Minister Osbourne Bodden and the chief officer in his ministry will be going along too. Meanwhile, the team will also be armed with what usually prove to be some of the most popular pins at international games. The 2014 Glasgow Commonwealth Game pins for the Cayman Team were designed by Jamie Doak and are in the shape of a turtle wearing tartan. The Olympic committee, which commissioned the pins, said they were happy to support local artists. "We have very limited numbers and with all Games pins, they are available for sale at $5.00 locally or US$10 plus the cost of shipping if you are overseas. All funds raised go back into the development of sport and athlete preparation in the Cayman Islands," they explained. (CNS): Police are on the hunt for a lone, local gunman who held up a food truck parked in Red Bay last night (Tuesday 22 July). Although no one was injured during the armed late night stick-up at the Al La Kebab mobile restaurant, the robber made off with an undisclosed sum of cash. The incident occurred just before midnight. Police said that 911 received the report at around 11.55pm. The truck was parked on the Red Bay Road close to the entrance of Selkirk Drive, George Town. The lone armed man had a slim build, was wearing black clothes a mask and a hoodie and spoke with a Caymanian accent. He was said to be carrying what looked like a silver hand gun when he approached the truck and demanded cash. Witnesses said he eventually made off on foot with an undisclosed sum of money but the direction in which he went is unknown. No shots were fired and no staff or customers were hurt. An RCIPS spokesperson said the officers on the case are seeking any information that may assist them with apprehension of the armed suspect. Members of the public who may be able to help are asked to contact 800TIPS (8477) or call the RCIPS hotline at 9497777 or any of the police stations in the Cayman Islands. (CNS): Local real estate agents have pledge $100,000 to Derek Haines' Cayman Hospice campaign to build an in care patient facility. The local runner is attempting to raise $1 million for the project by running six marathons in one year. Haines already has three under his trainers and is limbering up for the fourth, which will be in San Fransisco next weekend. With this addition to the pot, the veteran distance runner has raised over $600,000. The latest pledge has come from CIREBA, the Cayman Islands Real Estate Brokers Association, which is pledging the cash over the next two years to help construct the hospice facility on donated land near Camana Bay. More than 175 CIREBA agents and brokers will then be able to use the Cayman Hospice Care logo and label themselves as a “Supporter of Hospice.” With CIREBA members handling 85 percent of Cayman’s real estate sales, promotional material with a “Supporter of Hospice” logo will be seen by thousands of potentialbuyers and sellers who may also be motivated to donate to Derek’s campaign. So far this year, Haines has completed runs in Paris (April 6), London (April 13), and Pamplona (June 28) as he looks ahead to San Francisco (July 27), Dublin (October 27) and the Cayman Marathon on December 7. (CNS): Government officials have confirmed that eleven Cuban migrants now remain in Cayman following the repatriation of 21 people on Tuesday who had arrived in Cayman waters mostly on unseaworthy vessels. Despite dispatching those refugees back home on a chartered flight from Owen Roberts, under the supervision of prison officials, government currently has six more migrants housed at the Immigration Detention Centre (IDC) in Fairbanks, George Town. This includes two women and four men who will be joined shortly at the centre by a further five men who arrived in Cayman Brac on Sunday and sought repatriation. They are expected to be moved sometime today. (CNS): CUC turning off the power today to customers along Victory Avenue off Shamrock Road in the Prospect area as a result of engineering works in the area. The Grand Cayman based power firm said customers will experience interruptions to their electrical service between 9am and 2pm. The areas affected Wednesday, include the junction of Victory Avenue and Shamrock Road up to the junction with Summit Crescent. Motorists are asked to drive with caution when in the area. The firm's spokesperson also stated that a power outage on Saturday night impacting George Town was down to bad weather conditions and a flash over wires. "On Saturday evening we had an outage which affected parts of Crewe Road, Walkers Road, and South Church Street. The power was lost at 5:54pm and all power was restored at 7:22pm, "the spokesperson stated. "The cause of this outage was due to adverse weather conditions which caused a flash over of wires. "Flash over of wires" means when one phase connects with another phase." CUC said it apologized for the interruptions. (ASC): Academy Sports Club won the U13 Silver championship at the Schwan USA Cup in Minnesota last Saturday. The local club, which is well known for its focus on youth football, participated in the Schwan USA Cup with two teams in the U11 and U13 age groups. “Both teams did extraordinarily well”, said Coach Paul Byles. “Our U11s won their group with one of the best defensive records in their age group, and made it to thesemi finals and our U13s won their group without conceding a goal and eventually the U13 Silver Championship”. Byles said that both teams trained hard for several months and dealt with their challenges well. During the competition, both teams had tough quarter final matches withthe U11s winning on penalties and the U13s winning a very physical game by a 2-1 margin. The U13s eventually won their Championship match against Boca Juniors, a good Mexican team, by a 2-nil margin. Academy took 27 players and had the support of 18 parents on the trip. 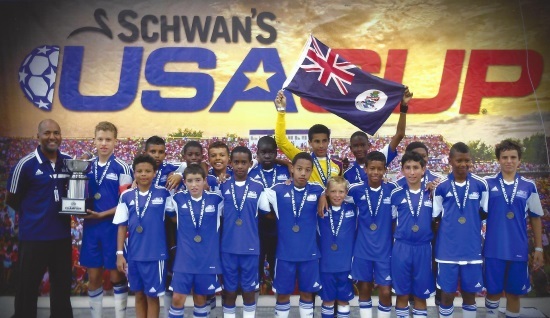 The club stressed that they were not only representing Academy but also the Cayman Islands as there are many international teams at the event. “Whenever we travel as a club we are very well aware that we are also representing our country and this is something that we always reinforce with the players. We always take a lot of pride in being able to show the world that the Cayman Islands has a lot of great young football talent”, he added. Byles added that the Schwan Cup is also a great experience generally for the players. The Schwan Cup is thought to be the largest youth tournament in the world; the event showcases more than 1,016 teams and 14,000 soccer players from over 17 states and 17 countries. All games are played at the National Sports Center, certified by the Guinness Book of Records as the largest soccer complex on earth. “This year’s U11 team consists of the same players which made it to the U10 finals at the Disney Youth Cup last year, so we can see that there is a consistent performance from these youngsters a year later”, said Mr. Byles. Byles said the players are still very excited and already talking about where they will compete internationally next year, but everyone will now take a well deserved rest before pre season training for the local CIFA leagues. Academy U13s also won both the FA Cup and league titles in the CIFA league this season and the U12 team which included primarily the U11 players that went to Minnesota also had a great local season as they won both of CIFA’s U12 Rallies. Academy also thanked the team managers, assistant coaches, parents and corporate sponsors for their support. 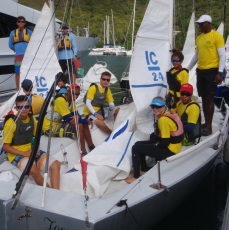 (CISC): The Cayman Islands Youth sailing team returned yesterday from a very successful showing at the Premier’s Cup regatta in Tortola, British Virgin Islands. They took silver medals in the regatta along with the Maxwell “Mackie” Simmons award for the team displaying the best sportsmanship. The BVI team took advantage of their local knowledge and sailed well to lift the trophy but our sailors beat out strong competition from Anguilla and Antigua to take second place. The Premier’s Cup, now in its 16th year, has welcomed hundreds of enthusiastic young sailors from across the Caribbean and the wider world. Competitors have enjoyed competing in the beautiful sailing waters of the Virgin Islands while fostering excellent camaraderie amongst themselves.This regatta allows young adults to come together regardless of their background to compete in their chosen sport, while also allowing for personal development within sailing. “The team sailed really well and had a great time interacting with kids their own age from other islands” explained Coach Kelvin Brown. “Two years ago we were placed 6th but the team is a little older and a lot wiser now so it was good to see them make so much progress. We would like to say a big thank you to the Rotary Club of Grand Cayman and Deutsche bank who helped out with the cost of the travel to BVI”. The team of 6 were sailing a 24’ one design boat similar to the J22 that they sail here in Cayman. Pablo Bertran and Florence Allan are now looking forward to travelling to China next month to represent Cayman in the Youth Olympic Games whilst Jesse Jackson and Andres McDermot are hoping to represent Cayman at the Central American and Caribbean games in Mexico in November. Allena Rankine and James Allen completed the team. Club Manager Rick Caley explained “this group of sailors are having an amazing year and are making their mark wherever they go. With their hard work and the dedicated coaching of our Instructors, along with the generous support of our sponsors, they are excellent ambassadors for Cayman”. (CNS): The leader of the opposition has said that the accusations hurled at him by those commenting on the CNS website on stories posted last week about the governor's attack on the press are unfounded. But despite the criticisms he faces from the public, McKeeva Bush said that he fully supports a free press and believes it is a "basic tenet of democracy". He said the governor's position over the Tempura documents has nothing to do with him but he said when it comes to a "free and fair Cayman" the FCO has had a wanton disregard, and commenters dragging him into the fight between the press and the governor are deflecting the real problem, which is that the UK simply does not care about the overseas territories. While people commenting may not like him or his policies, Bush said that didn't mean he had ever done anything wrong. Responding to a commenter who was attacking all politicians and suggesting that the opposition leader should have been prosecuted for unspecified allegations years ago, Bush said whoever it was must really hate him, but whatever people think about him the real problem for Cayman was the FCO. "The individual who drew me into their blog on the way the governor has insulted the press was trying to distract the matter of the FCO's wanton disregard for a fair and free Cayman," Bush said. "I have no boxer in this fight of the governor and the press but I do stand for a free and fair Cayman and freedom of a fair press is a basic tenet of democracy. That is in our constitution." The opposition leader said the FCO uses the overseas territories as pawns for a buttress and scapegoats in their European Union arguments and queried why anyone is surprised by what governors say or do to suit their purpose. "They have destroyed bigger men than me, and many viable countries have fallen because when the FCO should have cared for them, they didn't," he stated. Pointing to comments made by commenters tying him into the situation, he said much of it was because people didn't like him for a catalogue of reasons. He believes some don't like him because they couldn't get elected, some because they couldn't get status, but for others it was because they can no longer "rule Cayman like they did before or want to do as they please with us", as he pointed the finger at the British establishment. But he stressed that none of the reasons why people don't like him actually equate to him doing anything wrong. "And because they don't like me, it doesn't mean that I did anything to hurt them or these islands," he said. "I have done everything I could to stand against the efforts of the FCO, the UK Treasury and the European Union to make Cayman unviable as an offshore international business centre … I refused to put in place their income and property tax and VAT," Bush said. Despite the problems he faced when he was premier, the opposition leader said he had still managed well enough to keep the country's high credit rating when both the US and the UK fell down the rankings. Talking about his long career in the Legislative Assembly, he pointed out that he was part of the ExCo that put in place the Monetary Authority and the hedge fund law. "I put in place much of the good financial regulation we have today," he said, also noting other legislation unrelated to the financial services that he was responsible for that has helped the people of Cayman. "I put in place the policy for the establishment of the libraries in the districts, the policy to build the clinics in the districts. I also put in place the social legislation in Cayman that manages to help a very disenfranchised people with a modicum of decency, from sports to pensions, and took us out of masters and servants law that governed Cayman as labour legislation up until the 1980s . "Today pregnant women have benefits they didn't have when I got elected in 1984 and people who lose family members have compassion leave. The stealing of gratuities from the workers is a thing of the past too … So what little labour legislation we have today I fought for and had it put it there. And no one can say I hate foreigners as my own people say I give them too much room." Bush said he has fought for a more developed and inclusive Cayman and believes he has made a significant contribution as a legislator to bring about a better Cayman, "even if I should say so myself," he added, as he defended his long career in politics. "What is it that some of the bloggers want? They need to go and do some positive work to help Cayman rather than to keep saying all kinds of worthless and untrue statements about me and our people," he said as he hit back at his critics. "If what they say about me is true and they have the proof, why not say what it is and sign their name to the blog?" Bush said if he had done anything illegal the efforts to destroy him would have succeeded by now. Currently facing serious allegations, which are expect to go before the courts in September regarding the misuse of a government credit card, Bush insisted none of the allegations amounted to a crime. "What have I done thats illegal?" Bush asked rhetorically. "I used my credit card and payed it back which a lot, if not all, of the civil servants and ministers did. It was and still is an accepted practice within the civil service and the private sector." Pointing to comments made in Miami earlier this year by the former auditor general, Dan Duguay, a man Bush once described as a "cowboy", the opposition leader said the former auditor admitted knowing all about the credit card issue but he didn't carry out any audits about the use during his time here because he acknowledged that there were no policies in place to prevent it. "In the civil service there were no rules against using your card. And there was no policy set down by the minister of finance," Bush stated, explaining that Kenneth Jefferson, the financial secretary, didn't sit in cabinet after 6 November 2009 and so couldn't make policy. And, Bush said, his Cabinet didn't pass or make any polices relating to the issue.